[Episcopal News Service] Leaders of the Anglican Communion called the weekend massacre in Las Vegas “truly shocking” in a statement released from Canterbury, England, by Episcopal Church Presiding Bishop Michael Curry, as faith leaders mobilize outreach efforts in the wake of the shooting, which killed at least 58 and injured hundreds more. Clergy members in the Las Vegas area are providing pastoral care for victims and emergency personnel, memorial worship services are planned for this week, and a group of Episcopal bishops is organizing a nationwide effort to toll church bells Oct. 3 in memory of the dead. The Rev. Gay Clark Jennings, president of the Episcopal Church’s House of Deputies, also issued a statement in reaction to the deadly violence. “This morning, my heart broke once again to learn about another mass shooting in the United States,” she said in part, offering her prayers for the people of the Episcopal Diocese of Nevada, with their deputies, and Bishop Dan Edwards. The Roman Catholic Guardian Angel Cathedral is scheduled to host a prayer service for victims and their families at 5 p.m. Oct. 2, and the Episcopal Diocese of Nevada will hold a service at 7 p.m. Oct. 3 at Christ Church, the Episcopal church closest to the Las Vegas strip where the shooting happened. Edwards, who will preach at the Oct. 3 service, told Episcopal News Service by phone that his office reached out to the chaplain at Sunrise Hospital & Medical Center to offer Episcopal clergy members to supplement the hospital’s own pastoral care. The diocese offered the same to the Las Vegas Metro Police Department and other first responders. Edwards did not yet have information on how many Episcopal priests and deacons had volunteered. And with authorities saying blood supplies are running low in the massacre’s aftermath, the Diocese of Nevada plans to include a call for blood donations in its communications to Episcopalians in the state. News of the massacre developed overnight Oct. 1, and by morning it was clear the shooting at an outdoor country music concert was the deadliest in modern U.S. history. 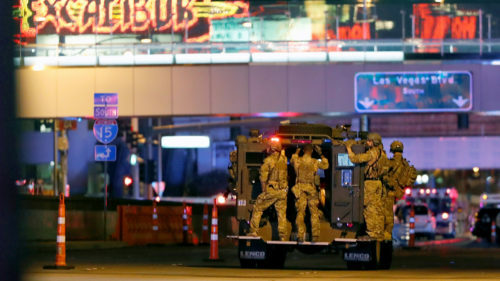 Authorities said the gunman fired down on the crowd from a room on the 32nd floor of nearby Mandalay Bay Resort and Casino, sending concertgoers fleeing. As of midday Oct. 2, the death toll was at 58, with more than 500 estimated injured. The gunman, identified as 64-year-old Stephen Paddock, later was found dead in the room, apparently after killing himself. Authorities also said he was found with more than 19 rifles. Bishops United Against Gun Violence is calling on churches everywhere to toll their bells Oct. 3 at the same time, 9 a.m. PT (noon ET) in solidarity. The number of bell tolls will mirror the number of dead reported at that time. Edwards, a member of Bishops United, said there are no simple reasons that the United States continues to see so many mass shootings, though he added there is a compelling case for looking toward the availability of assault weapons and the ability to possess them in numbers beyond what would be needed for legitimate personal use. He also pointed to the social problems of loneliness, isolation and disconnection, factors that he said are all too common in Nevada. It was too early to say whether members of local Episcopal congregations were among the victims or their families, though Edwards said an Episcopal priest’s son was one of the police officers who responded to the scene. The priest stayed up into the early morning until hearing that his son was OK. The Rev. Barry Vaughn, rector at Christ Church, has not yet heard of anyone else in his congregation affected by the massacre, but a message on the church Facebook page invited parishioners to call or stop by if they need to talk to someone. “I think everyone is just stunned by it right now,” Vaughn told Episcopal News Service. “The best thing that we can do is to reach out and love people who are affected by it. This sort of thing, it’s like a natural disaster. It can’t be predicted. “It comes out of nowhere, although it doesn’t exactly come out of nowhere,” Vaughn said, echoing Edwards’ concern about the prevalence of guns in American society. Reaction and condolences have been pouring in from all corners of the church, from the primates meeting underway in Canterbury to former Presiding Bishop Katharine Jefferts Schori, who previously served as the bishop of the Diocese of Nevada. “Prayers are ascending for all in the midst of this carnage at Mandalay Bay,” she said in an emailed statement. “When, oh when, will we begin to limit the availability of weapons of mass destruction and death? Bishops United Against Gun Violence issued a full statement on the massacre in the afternoon, offering not only prayers but also a call to political action on the issue of gun violence. “It is entirely reasonable in the wake of mass killings perpetrated by murderers with assault weapons to ask lawmakers to remove such weapons from civilian hands. It is imperative to ask why, as early as this very week, Congress is likely to pass a bill making it easier to buy silencers,” the statement says, noting that silencers make it more difficult for law enforcement officials to detect gunfire as shootings are unfolding. Jennings, the House of Deputies president, echoed that call to political action based on the Episcopal Church’s values. Some members of Bishops United spoke with Edwards in the morning by conference call, offering their support. “We assured him of our prayers and then we offered him any assistance that we as bishops could provide to him or the diocese of Nevada as they attend pastorally or otherwise to the victims of this massacre,” said Diocese of Connecticut Bishop Ian Douglas, one of the Bishops United conveners. Douglas helped form Bishops United Against Gun Violence after the 2012 massacre of 20 students and six adults at Sandy Hook Elementary School in Newtown, Connecticut. The group now totals more than 70 bishops, who have pushed for gun reform legislation to help prevent future mass shootings. “We must look into our own hearts and examine the ways in which we are culpable or complicit in the gun violence that surrounds us every day,” the bishops wrote. Thank you, and God’s peace and blessings for us all. Pray, and then pray, and then pray even more. The episcopal church opposes gun violence but it has no moral authority because it pro-actively promotes and encourages children and young people to reject Holy Scripture and practice sexual immorality and debauchery. The purpose and mission of the episcopal church is to publicly advocate sexual gratification and rebellion against God. Ben Q – why are you so angry? This is so obviously not true that it cries out for help.